The mobile applications economy is growing rapidly, thanks to the increased adoption of smartphones and media tablets. In 2017, it's forecast that over $75 billion will be spent on consumer mobile apps, according to the latest market study by Juniper Research. This growth will be largely as a result of the in-app purchase model gaining continued traction across many markets, and the impact of new monetization models used by app developers and storefronts. Their market study explored how the growing app ecosystem will be strengthened as storefronts -- such as Microsoft and Amazon -- attempt to advance against the effective duopoly which Apple and Google presently have in the global marketplace. The intensifying competition will lead to the release of new features within these stores, such as better search and discovery tools, encouraging developers to write their apps for the more peripheral stores. Nevertheless, Juniper also found that by 2017, the proportion of revenue accrued from apps paid for at the point of download would fall to almost a quarter of the $75 billion total. This presents a challenge for developers who are seeking to maximize the number of users and revenues from their app. Yet Juniper found that developers at the cutting edge of the market were using business models which allowed them to monetize 100 percent of their user base, through a combination of advertising and in-app purchases. 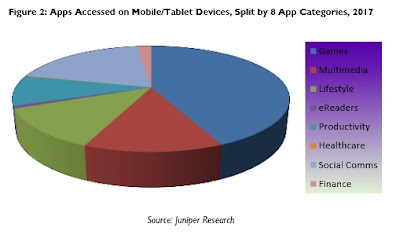 "It is not only developers who are seeking to capitalize on their user base; many app stores are also implementing carrier billing to ensure that unbanked consumers are able to pay for apps, which will contribute to the strong growth in app downloads," said Siân Rowlands, research analyst at Juniper Research. The amount of revenue spent by tablet owners will increase substantially, from $7.8 billion this year to $26.6 billion in 2017. The most popular category of app, games, will also see the greatest share of consumer spend, taking 32 percent of the total revenues in 2017.